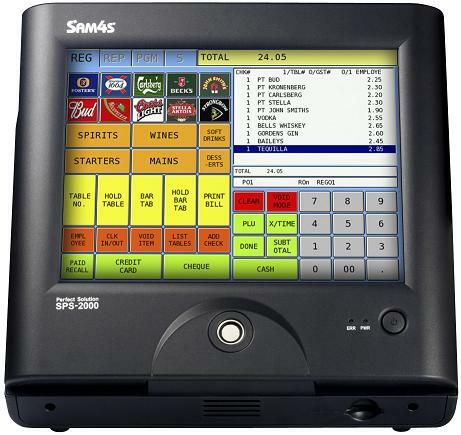 The Sam4s SPS-2000 features advanced touch screen technology. Pre-loaded with stable, proven and flexible software for both hospitality and retail solutions. The latest, high performance, solid state onboard flash memory negates the need for unreliable hard drives and unnecessary operating systems. The SPS-2000 provides vivid colour with high resolution TFT LCD touch screen which is protected from harsh operating environments. The viewing angle is adjustable between 22° and 77° degrees. Fast ethernet network capability allows sharing of transaction data. Versatile connectivity for peripherals via 6 serial, 2 USB, cash drawer, mouse and keyboard ports. Fast, secure and reliable operator sign on by Dallas key. THIS IS THE BEST TOUCH SCREEN ON THE EPROM BASED LEVEL. Click the button below to add the SAM4s SPS-2000 Touch Screen (Excludes Programming) to your wish list.